The International Federation of Library Associations will be holding its world congress here in Singapore in August. The theme is "Future libraries: infinite possibilities." Here is a link to the programme and the satellite meetings. Six of us met on Saturday (Kate B (SAS), Carla (EtonHouse) , Lisa (CIS), and two middle school literacy specialists -- Scott from SAS and Angie from UWC Dover) and added quite a few titles to the GoodReads bookshelves. These bookshelves include all the titles on the Listopia lists, but also include ones members suggested either in person or via email. We also looked at the current shortlists of our sibling awards: the Panda ones in China, the Sakura Medal in Japan, and the Morning Calm Medal in Korea. NB: Titles can still be added - the shortlists are limited to the longlists. You might find a great book over the summer, so keep reading! We're looking for someone to head up the Red Dot committee for next year -- and to call a meeting in late August so the shortlists can be announced at our September 4th meeting. Please let me or Linda know if you're interested. You might think about a joint-leadership position (i.e., two working together). Today I'm heading off to AFFC - http://afcc.com.sg - the Asian Festival of Children's Content at the NLB main building on Victoria St. The line-up includes Holly Thompson, Wendy Orr, Candy Gourlay, people from Shen's Books and the Paper Tigers blog, and lots of local authors and illustrators, not to mention our own Ben Farr on a panel at 4:15pm and Nancy Johnson doing the children's book awards keynote starting at 7:30pm. Hope to see some of you during the day. 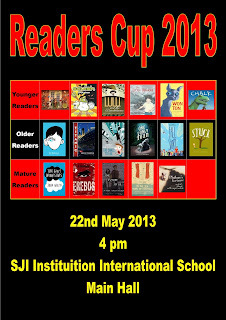 Now that Readers Cup is past, it's time to look forward to the 2013-2014 Red Dot Books. Yesterday at SJII, Lisa Patton (CIS), Kate Brundage (SAS) were chatting and decided to meet up this Saturday afternoon, May 25, 3 - 5 pm at the American Club, where Kate is a member, to discuss booklists. The club has wireless, which is useful, and Kate may be able to book one of the conference rooms. Anyone is welcome to join us. Just let us know you're coming, as Kate needs to sign guests in. You can email me (katie.appleton.day@gmail.com) or call/ text (8233-2922). We three feel on top of the best of recently published American literature for children and young adults, so are particularly looking for help on the Canadian, British, Australian, New Zealand, European, and other world-wide titles. If you can't come, but have some ideas, either email me or go to our GoodReads' Listopia lists where we are collecting titles -- and add or vote on books. Remember: only titles published within the past four years are eligible, i.e., 2013, 2012, 2011, or 2010. For translated works, we look at how many years they have been published in English. We also aim for a range of countries represented and at least one non-fiction book per category. Shortlists (to be announced at our September 4th network meeting) will have 8 titles each, so the longlists are typically 20-30 books in each. We'll publish our recommended lists here on Monday. 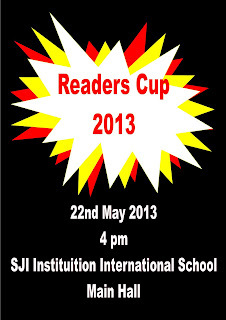 We had a very successful Readers Cup event yesterday at SJI International. For full information, including the scores for each team and the questions & answers for each competition, go to the Red Dot website - Readers Cup page. In summary, Singapore American School (SAS) won the Younger Readers, St Joseph's Institution (SJI) International won the Older Readers, and the German European School of Singapore (GESS) won the Mature Readers. Congratulations to all! The change in format -- from oral questions to written ones with timed rounds -- helped to speed up the length of each competition, though we still went over a bit. (The Mature Readers event finished at 6:30pm.) The change in scoring -- increasing the number of questions and adding the selection of a Joker Round for double points and 10% bonus points for finishing within 3 minutes instead of 4 -- did prevent tie situations, though narrowly. In the Younger Readers event, there was just 0.1 points between 1st place and 2nd place! 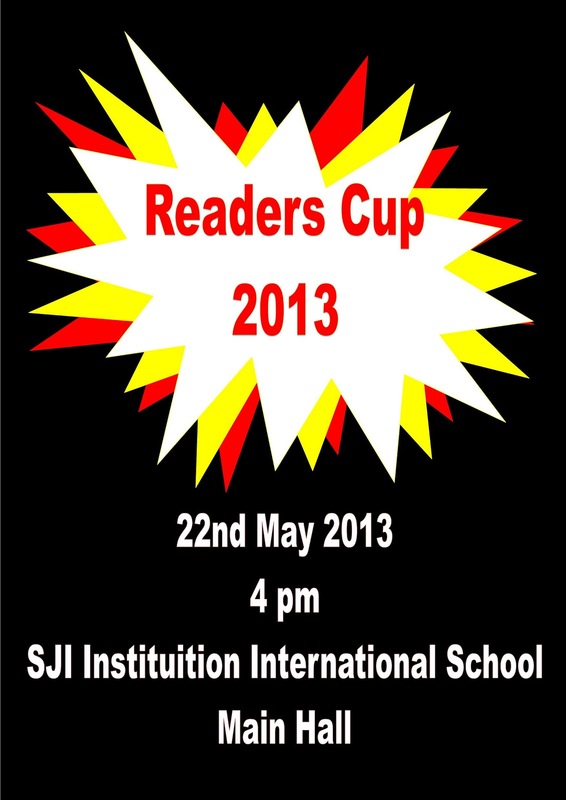 I'll put a Google Form up on the Readers Cup page to collect suggestions and comments on how the competition went. Do you have any photos or videos of the event you'd like to share? 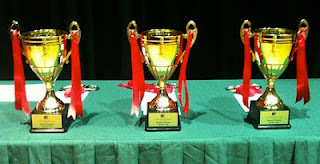 I've made a new Photos & Videos page for Readers Cup and have uploaded a few photos and videos that one of our teachers took for me. Many thanks to Siti Nurhidayah for organizing things so well at the SJII end. Lisa Patton at CIS Lakeside has already asked to host next year's event -- and Kate Brundage at SAS says she'll do it the year after. We are grateful to Cheryle Hum of Bookaburra Books for serving as a judge as well as supplying book prizes. Thanks also to APD Books for their generous support of book prizes. Special thanks also to Barb Philip Reid at Alice Smith School for sharing her experiences with Novel Knockout in KL and giving us the idea of timing the rounds and bonus points, as well as the all-important spreadsheet template for the more complicated scoring. Maybe next year we will go with her idea of using iPads for the multiple choice quizzes. At the very least I will be suggesting we use laptops and Google Forms for submission of the short-answer quiz as I killed quite a few trees prepping the quiz sheets this year. School visits by local authors available through APD. Our friends at APD have advised that they have local children's authors available for school visits at no charge. What an opportunity! One such author is Maranna Chan, creator of the Triple Nine Sleuths series. Triple Nine Sleuths is targeted at upper primary to lower secondary students (ages 10-14). The series follows the adventures of Secondary One students Corey, Colton and Stacy as they encounter and investigate a series of intriguing mysteries in their neighbourhood and around Singapore. As they search for answers, big secrets are revealed and surprising connections are drawn between old cases. Think Nancy Drew or Enid Blyton's classic Secret Seven series, but with a fresh, local twist: familiar locations like Serangoon Public Library, Nex mall and even St John's Island, and tech-savvy leads who use their smartphones and Facebook to aid them in their sleuthing missions. Click here for brochures, price information, etc. about Courtney Campbell. Courtney is already booked to perform at some international schools in KL and HK -- and is interested in stopping over in Singapore. I'm a singer/songwriter, storyteller/writer. 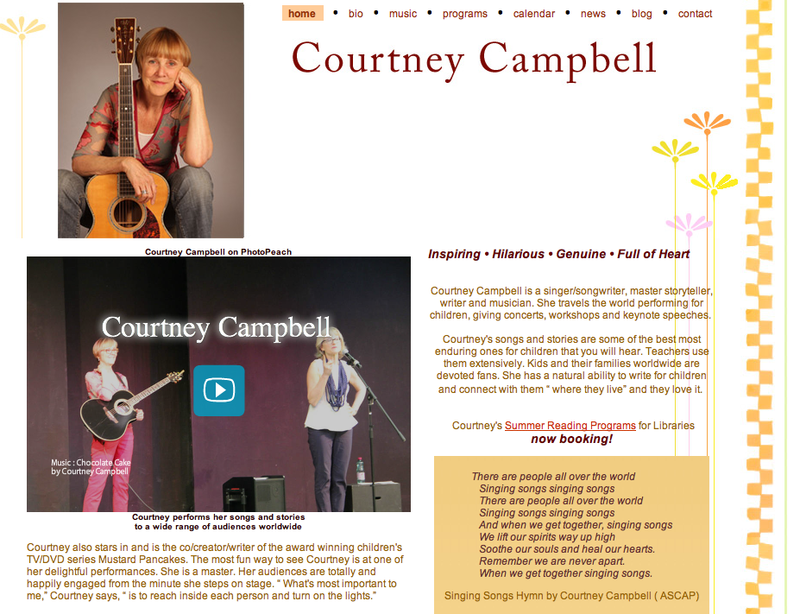 I've been performing in international schools world-wide for many years. I'm going to be on tour in KL in September/October and in Singapore November 4-15. Leanne Windsor of IIlliawara school in Australia recommended me to Katie Day. 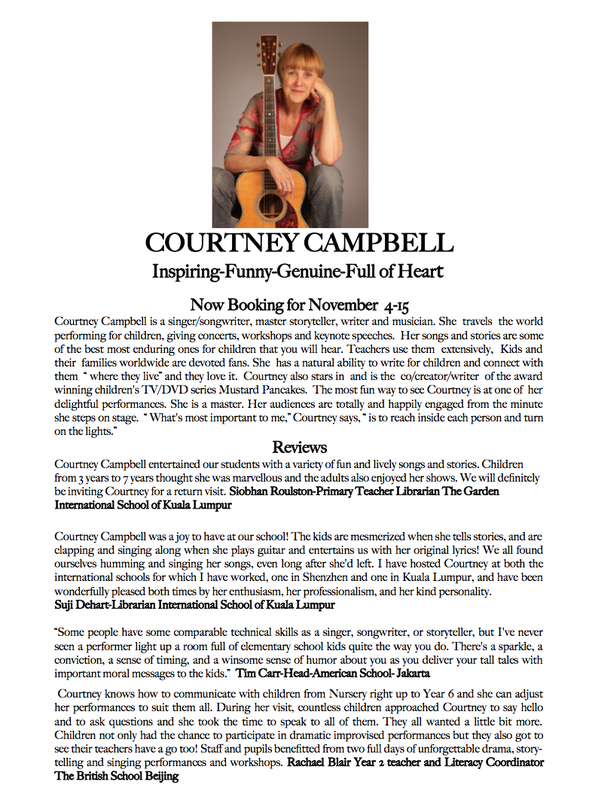 In KL I"ll be performing for Siobhan Roulston at Garden International School as well as many other schools. I"m available in your area November 4-15. To find out more about me you can go to my website: www.courtneycampbell.com. 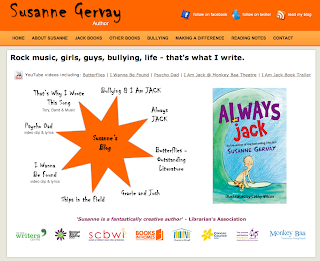 I"ve also attached some " information about myself, my fees and my work. 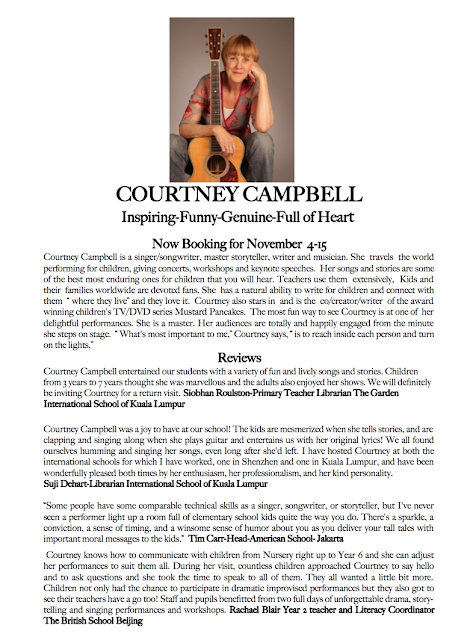 I would love to come and perform for your schools. Please contact me at: ctc@courtneycampbell.com. I look forward to hearing from you. It would be helpful to hear from you within a few weeks as I am in the process of booking all my tours for the coming school year. Sample questions for all the books (5-10 each) are ready, in Google spreadsheet form. Have your students create their own in the same vein for prep purposes. SJII also made some posters to help everyone advertise the event. The minutes from our April 22nd AGM are available here. And here is Nancy Johnson's slide presentation.